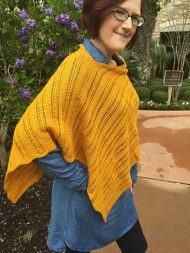 The idea for this wrap solidified while I was teaching at Rumpelstiltskin Yarns in Sayville, New York. In keeping with the name, I intended to work it in linen (i.e., straw), but I didn’t like the way the pattern showed up in such inelastic yarn. So, instead, I chose a beautiful gold lace-weight yarn in a scrumptious combination of silk and merino. The piece is worked as a long triangle, then two selvedges are sewed together, leaving a neck opening. The pattern is easily memorized and can be worked successfully with a variety of yarns and gauges. The wrap shown used up all of a single skein of Scrumptious Lace. Purchase two skeins and add more pattern repeats if you want a longer wrap. Every 13-stitch repeat added with lengthen the piece by about 1 3/4” (4.5 cm).